It started off as a business meeting but it was to be in an unusual setting, you see Frances worked from a home office and her home was on a private island. Toad’s Landing as it was affectionately called was a nearby piece of paradise. 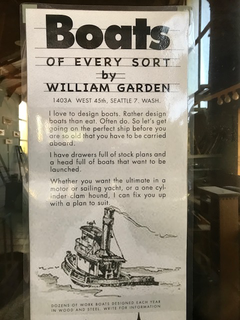 Measuring out at just over an acre, I learned Toad’s Landing was the home of legendary naval architect and marine engineer William (Bill) Garden who wrote, “I love to design boats. Rather design boats than eat. Often do.” Now that’s passion in action folks! Though Bill is no longer with us, I’m certain he couldn’t have hand picked a better couple to keep and restore the integrity of his beloved property – I feel like it could/should be a protected historical site, it’s so amazing. The tour around the island with all its intricacies took almost an hour and I could feel the love for the land ooze out of every word Frances spoke about her home. But there was lots of work to be done, she was getting married on that very property in less than a month. She and her fiancé spent every non-working minute working on this labour of love. I suggested she invite her friends over to help. She gave a polite chuckle and said she just couldn’t do that, she was a giver, she didn’t like to ask for help and even if people offered she wasn’t very good at accepting it. Hmmm. My wheels began turning. And guess what, even though it was hard, she said yes! So a few days later, on a beautiful summer evening we raked our little hearts out, we wheel barreled and tidied up a section of their property leaving it noticeably improved. We felt great. I’m pretty sure she did too! The best part as we worked and chatted alongside each other, as we sat down on the deck to enjoy the setting sun, a cool drink and her amazing dessert, we realized that we had an unexpected bonus from Frances saying yes. Her yes allowed us to shift our relationship from colleagues and business acquaintances to new friends. Sometimes it’s hard to say yes, to accept help, to let people do for you or with you but often times the yes is about much more than the task at hand, it’s about the unexpected side effects that come because of that yes. It can be an opportunity for growth for both parties. What will you say yes to this week? What can you ask for help with? What can you accept with a grateful heart? This entry was posted in Communication, Happiness, Motivation, Newsletters, Personal Growth and tagged e-news, happiness, Inspiration, personal growth, Your Life Unlimited. Bookmark the permalink. Next Next post: What’s your song?